BrisketU classes are designed to help you become a better brisket cook. Beef plate rib photo courtesy of BrisketU. A couple of summers ago, Mike Albrecht and Jon Kane wondered why there were no formal classes around to help people improve their backyard brisket skills. Barbecue popularity was skyrocketing, with long lines at popular restaurants becoming common, competitions popping up everywhere and an increasing focus on barbecue in the media. Soon thereafter, BrisketU was born. Albrecht and Kane set out with the idea of making barbecuing fun again, and to help the backyard cook learn how to cook a brisket like the experts. They enlisted Scott Valdiviez, who has been cooking in competitions and the backyard for 25 years, as the primary instructor. He grew up in barbecue, learning from his grandparents who catered barbecue for events and weddings. Fire building and maintenance is a big part of a successful brisket cook. BrisketU will help attendees improve your heat management techniques. Photo courtesy of BrisketU. BrisketU classes are held on Saturdays or Sundays at one of several Houston-area partner breweries: Town in City, Back Pew, Spindletap, No Label, 11 Below and Southern Star. The first beer from the host brewery is included in the registration. 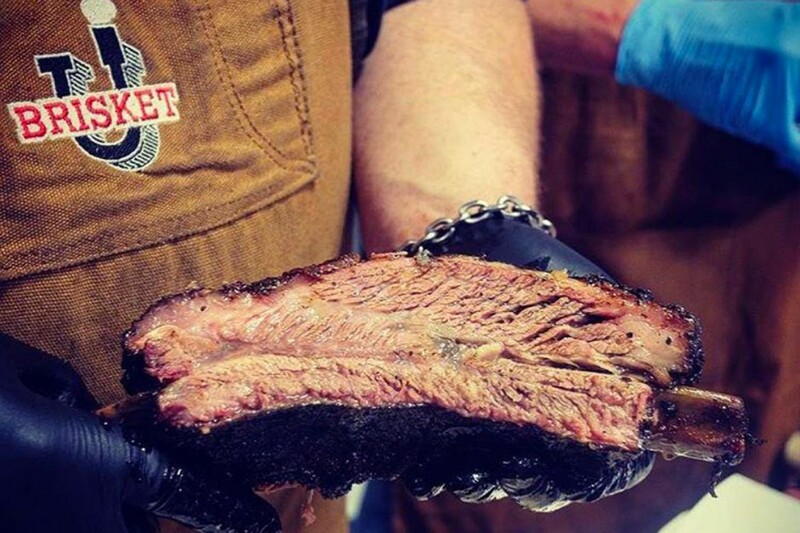 In the Certified Backyard Pitmaster class, BrisketU shares all the knowledge necessary to smoke a true Texas brisket: from fire starting and management to wood selection and smoke profiles. The class also teaches how to trim and rub meat, how to cook, slice evenly, serve and even how to taste. Each three-hour session includes indoor and outdoor class time around the pit. Attendees will leave as “Certified Backyard Pitmasters” by BrisketU. Valdiviez starts each classroom session with a raw brisket and goes over trimming and preparation techniques. Each class ends with instructions for proper carving and serving using a brisket he cooked the night before. Classes are capped at 30 students. While BrisketU is their primary focus, they also offer classes for private parties and corporate events. In 2016, over 1,600 people participated in BrisketU classes. Albrecht and Kane are looking to the future, and hope to franchise the BrisketU concept nationwide. Pitmaster and lead instructor Scott Valdiviez conducts the indoor classroom part of the course at one of the local partner breweries. Photo courtesy of BrisketU. Since Father’s Day is just a few short weeks away, if the dad(s) in your life enjoy spending time at the grill or smoker and would like to up their brisket game, a BrisketU Father’s Day Gift Box is just the thing. Each comes with a large 16-ounce container of BrisketU’s award-winning Graduate Spice Mix, a BrisketU pint glass, and a class voucher for attendance at one BrisketU Certified Backyard Pitmaster Class of their choosing. This is an over $100 value for just $89, including shipping. Classes are beneficial to both the novice backyard cook and the experienced griller/smoker. The Father’s Day gifts are hand-packed in an attractive red box. Boxes are guaranteed to arrive on time for Father’s Day with free shipping for orders placed by June 12th. Recipients will be able to select the class of their choice from one of the upcoming scheduled sessions, which are held in Houston, Austin, and the Bryan/College Station area. The schedule is updated regularly on their website. Visit the BrisketU website to order. For more information on the classes, visit the BrisketU website or their Facebook page. About The Author: Smoked meat enthusiast and barbecue competition judge Scott Sandlin authors the Texas Pit Quest blog, maintains the Guide to Houston-Area BBQ map, and is the barbecue (and general meat) columnist for Houston Food Finder.